SOIL is hard at work to refine our household ecological sanitation service, EkoLakay, so that we have a strong foundation as we grow to reach 15% of Cap-Haitien’s urban population with safely managed sanitation by 2025. As a part of these efforts, SOIL had the honor of hosting Peter Townsley in Cap-Haitien for a month late last year. Peter is the former CEO of a fellow Container-Based Sanitation Alliance (CBSA) member, Clean Team in Ghana, and he was instrumental in transforming their sanitation business into rapidly growing enterprise on a clear pathway towards financial sustainability. Although SOIL faces different challenges as we develop our service in urban Haiti than Clean Team does in Ghana, we were excited to have Peter share some of his lessons learned to help the SOIL team streamline operations and improve cost-efficiency. In the months since the visit, SOIL’s team has embarked on an intensive transformation program with our operational teams which involves a clear methodology both for identifying problems, and then quickly moving towards implementing appropriate solutions. The program is aiming to not just improve the way that SOIL provides sanitation service, but the entire culture of operations so that we are continuously becoming more accountable to ourselves and the families that rely on SOIL for safe household sanitation. 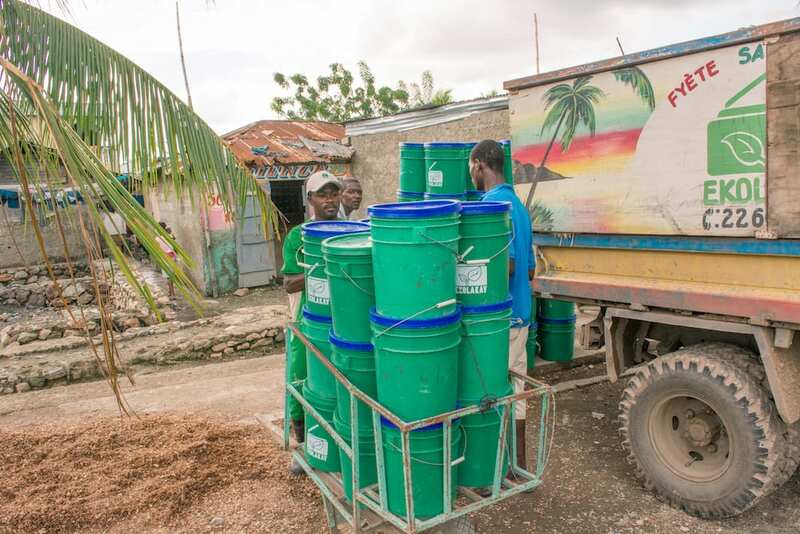 Since October, SOIL has already implemented some impactful changes to the management of SOIL’s depot, which serves as a point of transfer for collected containers that are making their way from families’ homes to SOIL’s waste treatment facility. Now, SOIL’s teams are out earlier every morning to help ensure that the EkoLakay teams are ready to go for the next day prior to leaving the site. Another change we’ve implemented is a refinement to our debt management protocols to help ensure that client’s debt from the monthly service fee never grows beyond 600 Haitian Gourdes. Another change to the service? SOIL has now created salary incentives to the EkoLakay collection team based on the number of clients each member of the crew serves. Although SOIL will continue to face challenges in the communities we serve due to poor infrastructure and inflation, which make making payments on the service more challenging, learning from our colleague’s work in Ghana has helped us to make some rapid improvements that are putting us on the path laid out during our strategic planning meeting earlier this year. We’re eager to see how these changes go on to further transform our work and look forward to sharing more stories about the evolution as time goes on! To stay up to date with the latest SOIL news, don’t forget to sign up for our monthly email newsletter by following this link. No Replies to "Refining SOIL’s Path to Financial Sustainability"